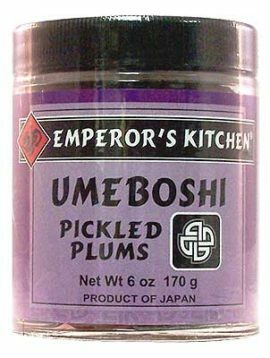 Emperor's Kitchen Umeboshi Pickled Plum Paste ..
Emperor’s Kitchen Umeboshi Pickled Plum Paste made from salt-pickled Japanese plums by simply removing the plum pit. This lively and versatile seasoning adds a pleasant tart, salty, tangy taste to salad dressings, sauces, and cooked vegetables. We love it spread lightly on sweet corn on the cob and on top of lightly steamed broccoli. 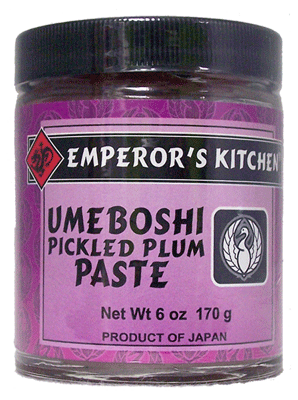 Besides its zesty flavor, Emperor’s Kitchen Umeboshi Paste is thought to have remarkable medicinal qualities. Its powerful acidity has a paradoxical alkalizing effect on the body, stimulating digestion, relieving fatigue, and soothing stomach disorders.